Since 1991 Somalia has been defined as a failing state, one that lacks an effective central government. The vacuum of power in Somalia, in turn, enabled Al Qaida and other radical Islamic organizations to find allies and refuge in there. 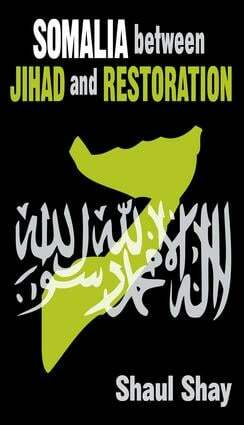 Shay's account shows how the presence of radical Islamic entities in the area, alongside local problems and conflicts, has turned Somalia into a focal point in the global war against terror. On June 5, 2006, the Islamic Courts Union (ICU) declared victory in its struggle against the Alliance for the Restoration of Peace and Counter Terrorism (ARPCT), a coalition of U.S. backed warlords. Shortly after their victory announcement, the ICU implemented a Taliban-style radical Islamic rule. The rule of the ICU was brief. In December 2006 they were defeated by a coalition of the Transitional Federal Government (TFG) and Ethiopian forces. In spite of the ICU's defeat, internal conflict in Somalia between the ICU and the interim government of Somalia (TFG), backed by Ethiopia, is still far from concluded. Shay shows how the internal conflict may spill over into other nations, creating a larger regional theater of Jihad. He also provides some ideas on how to prevent the foundation of a new radical Islamic state that could become a haven of the Islamic terror in the Horn of Africa. This volume is instructive in demonstrating the consequences of destabilisation. It will be of interest to foreign policy analysts, regional specialists, and strategists in the war against terror. Is the Islamic Courts the New Taliban?